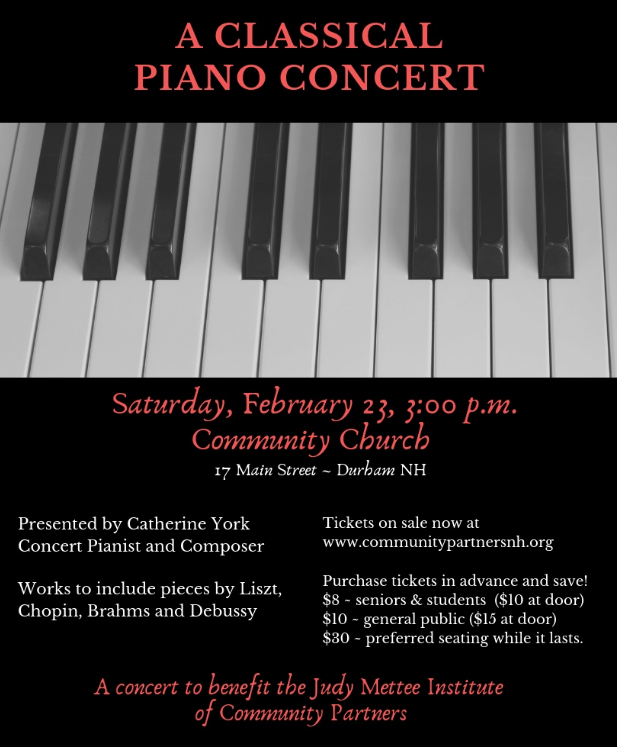 Join us for an afternoon of classical piano at the Community Church in Durham, NH to benefit the Judy Mettee Institute at Community Partners. NOTE: Tickets are available for purchase online in advance of the performance until 3pm Friday 2/22. The remaining tickets will also be available for purchase at the event on Saturday 2/23. Performing will be Catherine York Brower, a New Hampshire native and three time winner of the Granite State Piano Competition (1981, 1983, 1984). Catherine is a 1988 graduate of the New England Conservatory of Music, and a winner in the New England Conservatory Honors Piano Competition (1988). Ms. York Brower was a semi-finalist in the Stravinsky Awards International Piano Competition in 1989, and won the Commonwealth Competition for Young Pianists in 1991. She was the Guest Composer at Cornell University Center For Theatre Arts in Ithaca, NY, where she was also assistant choirmaster at Sage Chapel. In 1992 she was one of four national finalists in the Chicago Club of Women Organists Competition. 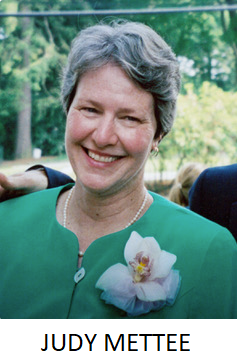 Ms. York Bower was the Resident Music Director and Director of Music Education at the Beck Center for the Arts in Cleveland, Ohio before returning to NH 2003. In 2005 her piano trio won the Chamber Music Foundation of New England’s International Chamber Ensemble Competition and performed at Carnegie Hall. Between 2007-2010 Ms. York Brower was Music Director at Prescott Park Arts Festival and from 2010 to 2014 she was Music Director at the Seacoast Repertory Theatre in Portsmouth. In 2014 she joined the staff at Community Church Durham. Ms. York Brower also released an album of piano improvisations on Christmas carols in 2011 which is now available on iTunes and Spotify. The Judy Mettee Institute (JMI) was developed to honor the work, dedication and memory of Judy Mettee, a longtime member of the Community Partners family. The JMI is an innovative professional development program for employees of Community Partners.